Girl Scouts of the U.S.A. (GSUSA) was founded in 1912 in Savannah, Ga., by Juliette Gordon Low, who wanted to provide experiences for girls beyond the usual household confines of the times by arranging opportunities for them to serve their communities and participate in camping trips and other outdoor activities. It appears that the first Girl Scout troop in North Carolina was organized two years later, according to notes in a history of the Girl Scout Council of Coastal Carolina. It is not clear where it existed. Another very early troop was in Southern Pines in 1918; its main purpose, and that of others organized during this period, was to help with the World War I effort by rolling bandages and knitting. The movement spread quickly during the Great Depression of the 1930s since there was little money in the average home for recreation; communities throughout the state recognized that young girls were in need of some interest or activity. Early Girl Scout troops were organized into many area councils based around urban centers. These small councils gradually merged, until Girl Scouts in the state's 100 counties became divided into eight administrative councils of volunteers and employed staff. From west to east, their names and headquarters are Pisgah Girl Scout Council (Asheville); Pioneer Girl Scout Council (Gastonia); Hornet's Nest Girl Scout Council (Charlotte); Catawba Valley Girl Scout Council (Hickory); Tar Heel Triad Girl Scout Council (Colfax); Pines of Carolina Girl Scout Council (Raleigh); Girl Scout Council of Coastal Carolina (Goldsboro); and Girl Scout Council of the Colonial Coast (Chesapeake, Va.), a council shared with southeastern Virginia counties. The councils maintain their own scenic campsites, each with unique features that allow for a great diversity of activities. The campsites are used for day camps, summertime resident camping sessions, and year-round weekend troop camping and adult training. Each council is governed by an elected board of directors of local adult volunteers, responsive to the membership through a system of elected delegates. By the early 2000s, more than 50,000 girl scouts, served by thousands of volunteer group leaders, were registered in North Carolina. In each council, member troops are organized by age and grade: Daisy (kindergarten), Brownie (grades 1 to 3), Junior (grades 4 to 5/6), Cadette (grades 6/7 to 8/9), and Senior (grades 9/10 to 12). These levels are flexible to allow for differences among school districts and in girls' maturity, and "sister troop" activities facilitate and encourage advancement upward to the next level. Each level gives special recognition for girls' achievements, the highest recognition being the Girl Scout Gold Award, which can be earned at the Senior Girl Scout level. There are also Campus Girl Scout chapters registered at most North Carolina colleges and universities, where students can continue their involvement with community projects and with local Girl Scout troops. Some of the troop and individual community service projects North Carolina Girl Scouts have initiated or participated in include making stuffed toys for hospitalized children, working on Habitat for Humanity homes, developing community greenways and parks, planning and constructing playgrounds at homeless shelters, implementing community literacy programs, and doing peer counseling and tutoring. The expanding scope of the Girl Scout program has kept pace with girls' increasing diversity of culture, interests, and needs while maintaining an emphasis on community service and outdoor enjoyment and appreciation. A wide variety of constructive and exciting explorations in the worlds of science, the arts, people, health, and the outdoors are included in the Girl Scout Handbook for each age level and in badge and patch activity books. Other publications on arts and crafts, ceremonies, songs and games, physical and emotional development, the sciences, and other areas of interest to today's girls are used; a regular revision cycle keeps these works relevant and appealing. Volunteer leaders share ideas and lists of local resources at monthly or bimonthly meetings, which are held to plan events and to give leader support. The required Leader Basic Training courses are offered throughout the year, as are optional enrichment opportunities. Whether held at university centers or well-appointed Girl Scout campgrounds, these sessions are always well attended. Prominent North Carolina women who have been Girl Scouts include Elizabeth Hanford Dole (U.S. senator and past president of the American Red Cross); Maya Angelou (poet, writer, dramatist, and Reynolds Professor of American Studies at Wake Forest University); Gloria Randle Scott (president of Bennett College and past Girl Scout National President); Sandra Thomas (president of Converse College and past vice president of Meredith College); Debra W. Stewart (vice chancellor and dean of graduate studies at North Carolina State University); Elaine F. Marshall (secretary of state of North Carolina); Betsy Justus (executive director of the North Carolina Electronics and Information Technology Association); Gwendolyn C. Chunn (director of the North Carolina Division of Youth Services); and Renee McCoy (TV news anchor). Girl Scouts Carolinas Peaks to Piedmont was formed on October 1, 2009 through the merger of Girl Scout Council of the Catawba Valley Area (Hickory), Girl Scouts of the Pioneer Council (Gastonia), Girl Scouts, Tarheel Triad Council (Colfax) and Girl Scouts of Western North Carolina, Pisgah Council (Asheville). The new council serves 40 counties in central and western North Carolina. See Council History here: https://www.girlscoutsp2p.org/about_us/council_history/index.htm. 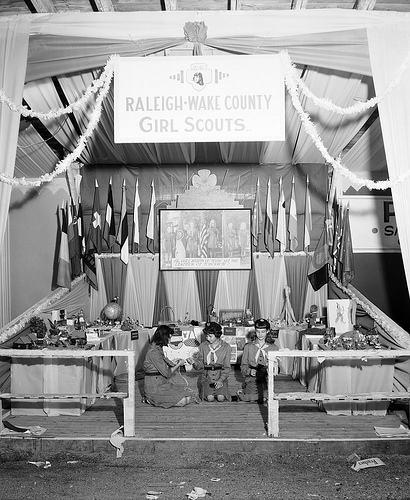 Girl Scout Demonstration at State Fair, Raleigh, NC, October 19, 1946. From the Albert Barden Collection, North Carolina State Archives, Raleigh, NC, call #: N_53_16_4247. Available from http://www.flickr.com/photos/north-carolina-state-archives/2478404105/ (accessed November 2, 2012). 1 January 2006 | Brashear, Grace R.